Brandy Got The Royal Treatment! We all went on a wonderful vacation together (Brandy’s first Big Trip!). It was so much fun. We stopped in San Simeon, Monterey, San Francisco and Mendocino, and came back through Yosemite and Sequoia Nat’l Parks. We traveled in mid-October, and really enjoyed the fall foliage. Traveling with Brandy was like being part of an entourage that travels with a celebrity!! She was like a magnet, wherever we went, and we literally met hundreds of people. We stayed in pet-friendly lodgings, and were treated like royalty. We would overhear waitresses at the lovely outdoor restaurant we dined at in San Francisco telling other patrons “Oh, that’s Brandy. She’s a wonderful dog!”. The concierge of our hotel was completely enamored of her, as were the people attending the daily wine party in the lobby!! It just went on like that. At the Inn we stayed at in Mendo, we actually were able to dine in the bar area, which was lovlier than the dining room, with a giant fireplace, and a grand piano. Brandy made many friends here as well. Many restaurants up north cater to people with their pets. 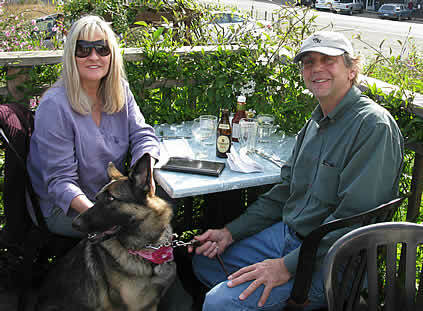 We dined at a restaurant in Monterey that actually had a menu for dogs.